« . 29 things about my 29th birthday . Hey now… bars make for excellent study fuel, so you’re really only improving your chances of success by taking some time off to make these 😉 Good luck with the exams! Do you happen to know the Protein, Calories etc. in each of these bars? Hi Sharon head to http://www.myfitnesspal.com and type in these ingredients. The website will calculate the nutrition values. Greetings Amanda !! Thank you for sharing your recipe ! The ingredients listed is exactly what I want to use, with the exception of chocolate chips, so I’ll sub using raisins. Hi Mary, I’m not sure how you got those values, but that isn’t anywhere near what I came up with. For mine it was 150 calories, 20g carbs, 6g protein, 6g fat, and 9g sugar. Great minds think alike….I have a granola bar recipe coming up too! They are one of my favorite snacks also and yours look way better than any prepackaged bars I’ve had. Yesterday was not too normal for me either – I took the day off work … hehehe. Oh these look so good, Amanda!! Almond butter + chocolate is one of my favorite combos! I can’t wait to give these a try! Thanks for sharing!! Your food photos are always so beautiful! They make everything look so appealing! These look awesome! I am curious…what plugin/service do you use for your writing up your recipes? If a granola bar isn’t dense and chewy, then I won’t eat it. I really don’t like the ones that taste like air! These look perfect. I (obviously) didn’t know you had a peanut allergy, so no wonder you can’t eat most bars! I do like Luna bars, but homemade – always better. Pinning this one! Well they look delish!! I have an old bottle (are they bottles?) of whey. I needed something to do with. I might give this a go!! Thanks!! I’m super excited about this recipe! I always buy my granola bars, but I’ve really wanted to try making my own. They seem so easy to make and your recipe sounds like a perfect way to get started. Pinned and can’t wait to try them! Well my goal this year is to make more snacks for the kids from scratch so our minds must have synced up with this one! This is perfect. Ok sometime this week, I’m going to make these bars. You always post these creations that look amazing, and I can’t not make them anymore. Plus, we’re always looking for good snacks, but I refuse to pay for bars and whatnot these days because they’re expensive and not overly filling. Smack me if I don’t make these! And up they go on my list of things to make when I am going back home in May and have an oven again. I have the feeling I am going to live of a lot of baked goods this summer 😉 But yeah, definitely a great recipe, lady. I love making my own granola bars. Good thing that some of them are no-bake so I can even get them done in my tiny French kitchenette. These look absolutely fantastic! Perfect snack for at work and better than regular ol’ granola bars! These look so good! I’ve always been too lazy to make my own bars, but I’m really starting to think I should! It seems like my Monday wasn’t the only one that felt completey off. The first full week of work after the holidays and I’m already longing for the weekend on a Tuesday?! That’s not right. At the risk of loosing my blogger credibilty I’ll have to admit I’m not a fan of bars. Can we still be friends? I’m convinced part of it is to blame on my dad always packing a certain kind of granola bar for any kind of bike tour, hike or whichever other family activity when I was younger. More often then not in a flavour I did not like. Later on, when I got interested in healthy living, I studied the ingredient label of one of those bars and did not (! )like what I saw. Hard to believe what companies put in there – and how many ingredients at that! Far from what your bars look like. Oats, honey, almond butter – that’s the kind of ingredient list I like. You may or may not get me into the bar business ;). And if we’re talking -chocolate- bars, however, I’m all in anyways. Another spoons recipe!!! I definitely need to make these since I’m not on a strict apartment hunt budget and can’t spend all my money on granola bars…I’m out of my gingerbread bars too so these will be the perfect replacement. These look so much like Chewy brand granola bars!! Amazing. You’re a bar genius. I was about to say I can’t make these since I don’t have protein powder in the house but I think someone gave me a sample packet. If I do in fact have some, I am making these. I try not to buy packaged granola bars and have made some myself but haven’t in a while. I do need packaged stuff on occasion for my son to grab as a snack in between activities. I try to give him fresher things but packaged things happened for two reasons – for one, he thinks I am weird when I get all ” fresh” on him and two, I don’t want the other kids to think we are totally weird. lol. I think that if you wrap a wax paper wrap inside another wrapper and tape it shut no one will notice that it is not a store bought one but you and maybe him but who cares? You need to take care of your family that is why we make our own. TWINS! 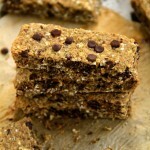 2 Protein Bar recipes on one day and both are from US! I love you. And them. Drooling over these, Amanda! You always have the best recipes for on-the-go snacks (omg those other protein bars you posted) and I love the shorter ingredient list! I’m pretty sure I have most of the thing I need to make them, so hopefully these will be in the tum soon ;). Beautiful pictures! Your photography looks fantastic! Yum! I love making my own bars over buying them for 5x the price. I saw these on Instagram yesterday and was so excited for you to post this! I had the same ‘wait..i have to work 5 whole days this week’?! Thought too. 🙂 These look lovely! Yes!!! That is what kept going through my mind as I read this recipe. I have absolutely every ingredient to make these EXCEPT the almond butter. And that, my friend, is because almond butter costs about $15 a jar where I live, and I have a hard time believing that any nut is worth that. HOWEVER, I actually might invest in some to make these. And maybe I’ll actually like it! I really love the taste of (most) boughten protein bars, but don’t love the price! but since i love to bake and eat natural ingredients, well, lets just say i already printed this recipe out! I’ve actually been looking for some decent bar recipes to pack for lunches and such. Thanks for sharing and I hope you get your work fitness on. HA. Wow these look perfect! Like so perfect you would swear you just unwrapped them from one of those big shot granola bar makers and took pictures of them. Delish! These sound amazing! All my favorite ingredients. I’ve never thought of baking them since I always go for the no-bake method…but now I’m intrigued. Thanks for sharing! I have actually never tried to make my own protein bars, but I probably should. Love the simple ingredient list on these and pinned to my “recipes I will actually try to make”. Can you sub chia seeds for the flax or no? Thanks for sharing! I’ve never tried it, but I would assume that you probably could. I really only threw them in there as a last-minute idea for some added nutrition. WHAAAAAAAAAAAT. These are basically vegan if I use my Vega protein instead of whey. Happy dance. Making them. I just need to go buy a bag of (vegan) chocolate chips! Oh these sound good! I hope today is a little easier with getting back into the swing of things. I know the first few days after a vacation are hard, i usually miss my mid day nap! Stay warm! I use Proteins+ from Genuine Health http://www.genuinehealth.com/store/proteins#.UsxecqUzDwI Their whey is guaranteed GF. I feel so bad about your pesky allergies because I know you would LOVE a lot of the bars on grocery store shelves. You would REALLY love the cookie dough Quest Bars even if they have a lot of weird ingredients, they are pretty dang good! And I definitely think all fast food restaurants should be in court for false advertising! There is never something which looks as good as it does in an ad/commercial. Total letdown! Yum! These granola bars look awesome! I’m not a fan of protein powders, though — what would you recommend as a substitute? Thanks!! You could probably just sub it with an equal amount of flour, or oat flour if you wanted to keep them gluten-free. You may have to add a few extra tablespoons of milk if the mix feels too dry. First off…. HAPPY BELATED BIRTHDAY!!! You could probably sub it with an equal amount of flour, or ground oats if you want to keep the bars gluten free. I love recipes that sound delicious AND healthy AND for which I have every ingredient right here at home. Thanks! Can’t wait to make these today. I buy my bars (Luna are my favourite) but If I have the time I think they taste so much better homemade! I love adding craisins, almonds and of course a little chocolate 😉 (preferably white or dark). You know I can totally relate to you here. Why can’t there be a company that makes good nut free bars (or at least free of all nuts except almonds)? I mean, I think the Enjoy Life decadent bars are tasty, but they’re not really a granola bar and they don’t really have the kind of nutrients I want in my snacks. And the nut free Quaker bars are even worse in terms of nutrition. Which pretty much leaves us without options unless we bake our own, so I almost always have homemade granola bars/snack balls on hand. These are definitely getting put on my to make list! I seriously need to start making my own bars. I used to love granola bars back in the day but stopped eating them since they are so processed and contain some very unnecessary ingredients. I love that everything in these is REAL. I’ve actually never tried my hand at making a homemade granola bar! Of course as usual, this looks delish. You have inspired me to create more recipes this year, and I wanted to get a jump start on that today since I’m sick at home doing nothing, but then I looked in the cabinet and saw that my family has no vanilla extract. -___- What kind of prison do I live in?! Just kidding. On a diff note, I have been meaning to ask you this question that popped in my head the other day when I was eating almond butter and looked at the jar – it had that dreaded phrase on it. So do you make your own AB or are there safe brands for you to consume? There are some safe ones out there (thankfully)! Maisie Jane’s is my favourite, and Barney Butter and Justin’s both have peanut-free ones as well. I love how easy these are! And simple, real ingredients that are totally accessible .. I’ve just discovered your blog. I’m happy to have found you! Aww well thank you Marquis! Hope you’re having an awesome Tuesday! YES. Granola bars can be so underrated, especially since a lot of the store-bought ones can be flimsy, overly sweet, and not quite satisfying. (I do love some of them out there though! Not hatin’ on all of them for sure.) But something about homemade granola bars, like you said, are just so wonderful. I love that you can customize them too! I say huzzah to coconut in these babies. I recently made some homemade granola bars with dried apricots, prunes, oatmeal, chia seeds, hemp seeds, and almond butter. They are gooood. And hey— no peanuts! 😉 I think I’ll have one now. If you don’t have flax, is there something you can substitute? You could replace it with chia, and if you don’t have that then you could probably just leave it out completely… it was just a last minute addition. Great recipes! Keep them coming- my tummy loves it! Ha hello Tina Fey- Yesterday was Nuts. Actually, it was nuts. Stupid weather here made me sick. Great recipe LCP- No 1000+1 ingredient list here and typical Amanda staples- love it. What brand of whey do you use for baking? I’ve found I can only generally use Casein of mixed blends- the whey I use tends to create hockey pucks! You should be well aware of my go to recipe, but for packaged ones- as much as I’d prefer to make my own, a Quest bar is a good grab in a pinch! I use Proteins+ by Genuine Health, but yeah… I’m pretty iffy on using whey in baking because it came come out disastrous. I was keeping my fingers crossed while these were in the oven! mmm! These are perfect for on the go!! These look so good!! And I’m with ya on store-bought bars. The only ones I “approve” of are Larabars. Otherwise? Homemade, please! I like the new recipe format. Look at you: we’re only days into 2014 and you’re already making fun little blog updates. I’m impressed. You get two snaps and a twirl from me. I hope you post more savoury dishes as well! These look so good! I can’t wait to make them. I would make them right now but it’s 9:30pm and I fear I won’t be able to control myself once they’re done… Tomorrow it is! Who wouldn’t want to add chocolate?! Crazy! Chocolate is always necessary. I couldn’t agree more 😀 I like the way you think! p.s. your reference to McDonalds cracked me up. Storebought granola bars… So many stupid ingredients, not the least to mention– peanuts, dairy, wheat, etc. I tried making homemade ones for kicks a few years ago and they just tasted healthy and bleh… I wish I’d had your recipe then. Will need to show this to the family and see what they think. I have to run everything by them now since they are the ones eating it all. Lol. Well…these look decadent. I’ll be making them ASAP. Are those white spots the protein powder? Or just the oats? Just the oats — chunky protein powder is a big no-no. OhhhhHHHhhHHHH Amanda. I need these in my life immediately! I just got a ridic amount of protein powder that I’m beyond obsessed with, so you better believe I’m gonna whip up a batch of these bad boys! Genius, I tell ya! These have just been saved to my email and my to-do list 🙂 I’ve been looking for something else to pair with my yogurt or just my afternoon hunger! Thanks for the recipe! YUM thanks for sharing. I’m going to try to make this this weekend, pinning now so I don’t lose the recipe. Aww, I remember my little homemade protein bar phase! I made some coconut almond cranberry ones that were DEEEEElicious, but sadly, not nearly as pretty as yours! http://www.kissmybroccoliblog.com/2012/08/06/my-addiction/ It’s funny, because it all started with me trying to recreate a packaged almond butter bar…only my finished product was NOWHERE even close! Haha! Favorite add ins: chocolate chips, coconut, and rice crispies! I love a little crunch with my chew! i am so glad you are posting more recipes! they are always so simple and tasty. case in point, i’ve made these 3 times already and am going to whip up another batch as soon as i post this comment! thank you for such lovely treats! so i think i may love these bars a little toooo much (is that possible?) and was wondering while i was making my 4th batch yesterday, would it be possible to make these no-bake? if i left them in the fridge or freezer for a few hours, do you think they’d come out as tasty? Hmm… They would still taste good (I’ve eaten plenty of the batter raw), but I’m not sure they would actually set without falling apart later. You can always give it a shot, and then just throw them in the oven if it doesn’t work out. UMM OMG. i made these today and they are so so good!! first granola bars i ever made that didn’t fall apart. i love them so much. want to make them all the time. thanks!! I made these yesterday and I’ve already eaten half… YUMM. These bars are fantastic! Ive made them three times already and cannot get enough of them, my clients love them as well. Can we provide me with the calorie count please? Hi Gena! I’m sorry, but I don’t calculate the nutritional value of my recipes — I just focus on using wholesome ingredients. I don’t have protein powder! Do you think if I use almond meal/flour it will work just as well? Thanks! You could definitely sub out the protein powder for flour or oats, but you might have to adjust how much milk you use. 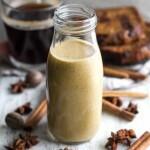 Instead of using nut butter, would coconut oil work just as well or no? Eeee I don’t think so sine nut butters are gummier and stickier than oils. It still -might- work, but you would need to use a lot less… maybe only 2 Tbsp? I made granola bars for my 4 kids loosely based on this recipe. I didn’t have all of the right ingredients, so I improvised. Powdered milk for whey protein, skipped the flax seed meal that looked like moths took up residence, condensed milk instead of almond butter and honey and vanilla yoghurt instead of milk and vanilla. It looked a little bit lacking, so I mixed in some cocoa powder, poured it into the pan and then sprinkled the top with a few chocolate chips and patted them down. Hi! This is the absolute best foundation recipe for a carb/protein bar! It combines my carb cravings with my protein hanckerings! I increased the protein powder and added chopped almonds, sunflower seeds, shredded coconut, and dried blueberries. The next batch I make will be with chopped dark chocolate, cayenne pepper, and sprinkled with sea salt. It is an absolute fantastic base recipe and I am very appreciative of your efforts to post the pics and recipes.! I can almost taste these granola bars. It actually deserves some extra praises for including chocolate chips (yum!). 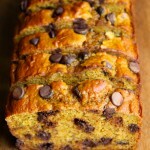 I like the idea of adding dried fruit but it will be in addition to the chocolate chips. My question! Please let me know how to store these! Do you wrap them up separately and just store in a tupperware on the counter? or do you keep them in the fridge? i want to individually wrap them so he can take them to work 🙂 THANKS !! I usually just store them in a tupperware container on the counter, and transfer one to a small snack bag when I need to; unless they’ll be sitting for longer than a week, then I store them in the fridge. These look great but I don’t eat honey (or maple syrup ). Do you have a suggestion for a replacement? Not sure if I need something sticky or just sweet., or both. I’ve never tried making them without a sticky sweetener, so I can’t vouch for the results, but you could -try- using something like a dark brown sugar in place of the honey. You would probably have to increase the amount to 1/3 – 1/2 cup though. Thanks. I was hoping to keep the bar low glycemic. I am going to try a combo of black strap molasses and erythritol . Not sure how much of either but will just wing it. Can you provide the nutritional information, please? Sorry Joanne, I don’t calculate the nutritional info for my recipes — I just try to focus on healthy, whole ingredients! These look amazing! If I make a large batch, how long will they keep for? How to prevent them from going bad so soon? They should keep fine for at least a week, and you can always wrap them individually and freeze them if you need them to stick around for longer than that. They defrost just fine! I’ve made granola bars many times and they fall apart. Do yours tend to stick together when slicing? They do! I’ve never had any problems with them crumbling or falling apart. One more question I forgot! Rolled oats, are these the large flaked oats or quick cooking oats? Doubled the recipe and Instead of chocolate chips I added coconut, raisins and almonds. Turned out so good. Thanks for the recipes. To buy these are so expensive and not as good. Or as healthy. I’m sorry to hear that! It might have just been a difference in consistency of your honey or nut butter. You can always try to add an extra spoonful of each, and make sure you pack it down really tight in the pan — that helps them stay together. Perfect and delicious! Family LOVED these, will become a staple for school snacks but will use sunflower seed butter and goat milk to keep them nut-free. Thanks for the recipe — it’s a keeper! These were delicious! I just pulled a batch from the oven, hubby loved them too. I melted the wet ingredients so that they would spread more easily. The chocolate chips melted (but that’s never a bad thing in my book:) Will make again — thank you for sharing your recipe. Hi – thank you for this recipe! They are so delicious. I made a batch without the flax since I didn’t have any, and they still turned out great. I *do* calorie count and watch my carbs a little bit, so I altered the recipe – I used 1.5 cups of oats, natural PB, and 2 scoops (its easier for me to measure than to measure by cups since the nutrition info is by their arbitrary measurement of what a scoop is) of PB Marshmallow flavored whey protein (which amped up the PB flavor since I used natural PB in this batch instead of almond butter). I made them into 12 “cookies” since I had trouble previously cutting my granola bars to look as nice as yours! I had one fresh out of the oven because they smelled so good – yum! Mine come in at around 150 calories a pop. For anyone who cares, yours are about 200 calories a pop (the protein powder makes a slight difference!) – but since you use good ingredients, the calories should only matter for someone who is strictly counting like me. Also, love how easy the recipe is to make! Thanks again! These are spectacular! My family has made these 3 times with almond butter and peanut butter. Both were great but we definitely preferred with almond butter. Also we added dark chocolate chips, coconut, pecans, and 3 times the protein. These make for the perfect meal bar, especially when on the go (without all the chemicals from store bought bars). Just made a batch of these — the flavor is terrific, but I had zero luck in cutting them — as soon as I tried, they just crumbled apart. Might try them again as drop cookies to avoid theknife. My son and I loved these! Thanks for sharing. Question for you…have you ever tried freezing them? I haven’t — mine never last that long 😆 But I imagine they would be fine frozen! These were really good. I made them exactly as the recipe stated the first time and the 2nd time I subbed almond extract in place of the vanilla and replaced the chocolate chips with dried cherries. Excellent recipe! Thank you! These look absolutely amazing! Can I substitute the nut butters for regular butter? Boyfriend suffers with nut allergies and these look to yummy to miss out on! I’ve never tried it so I don’t know for sure, but I expect that the texture and taste of the bars would be different. You’d also probably have to decrease the amount to something like 2 Tbsp. Has your boyfriend ever tried a soy nut or sunflower seed butter? Those are great alternatives for people with nut allergies! Hi Amanda! great site . Can’t wait to make the pumpkin muffins, the cookies, and granola bars. I’ll will share this on my fb page. Thanks!!! What do you recommend is the best way to store these? I always store mine in an airtight container in the fridge. You could also wrap them individually and freeze them if you need to keep them for longer. I made these but they went really flat they don’t look thick and crunchy like yours what did I do wrong haha? Any suggestions for replacements for the nut butter? For example could I use applesauce or greek yogurt? Unfortunately, applesauce or yogurt wouldn’t work as they’re not nearly thick enough and the bars probably wouldn’t hold together. The only substitute I can think of would be a seed butter if you’re dealing with a nut allergy. Hi, I was wondering if I can replace the protein powder with something? Any alternatives for that? Or can I just omit it altogether? It would be fine to omit it altogether. These were absolutely amazing! I used unsweetened vanilla coconut milk, PB, and dairy free chips and they were DELICIOUS! thank you for sharing this great recipe!!! Hi, I’m curious, I was thinking about making these but I’m dairy-free. I see you used coconut milk and dairy-free chips, but how did you replace the whey protein powder? Thanks! You could simply use a plant based protein powder, Gabrielle. Vega makes some really good ones, as does Plant Fusion. A rice based powder would probably be your best bet since it has the mildest taste. Have you tried these with Chocolate protein? If so how were they? I really want to make these, the only protein I have on hand is chocolate. I am wanting to make these, have you ever tried Chocolate protein? That is all I have on hand. Hi Cathy, I’ve never tried them with chocolate protein, but I imagine they’d taste just fine. If anything, you can just leave the protein out completely and simply have granola bars. Hi Amanda, I just finished baking a batch of my own homemade granola bars which have all but disappeared after the kids came in from school 🙂 Mine come out super crunchy, similar to a Nature’s Valley bar texture. I’ve been in search of a good chewy bar , the pull apart kind and stumbled across your site in my quest for tips to achieve chewiness. I’m excited to try yours. Your photos are awesome! Would you mind sharing the app or type of camera you use? Thanks for sharing your recipe! Thanks, Aisha! I use a Canon EOS7D to shoot my pictures. This is the second recipe of yours I’ve used this week(sans flour banana muffins was the other), both were complete successes with the picky husband! Just made these, made a few substitutions based on what I have and changed the add ins. This was a FANTASTIC base and can be altered to your liking. I used homemade Sun Butter (been looking for good ways to use it up, this was perfect). I subbed one ounce of pitted dates for the honey, soaked in So Delicious brand coconut milk beverage (used instead of almond milk) and blended together. For add ins, instead of chocolate chips, I folded in one tablespoon raw Hemp Seeds, 1/4 cup dried cranberries, 1/4 cup slivered almonds, and 1/8 cup unsweetened shaved Coconut chips. I owe this DELICIOUS batch of granola bars to this blog, they seriously came out amazing. Hi Amanda – definitely going to try these out with the recipe as is. I do however have a young one in school and would love to send a bar like this as a snack, but because it has nut butter I couldn’t. Do you have any suggestions of what I could put in place of the nut butter if I were making school friendly snacks? wonderful recipe – easy to make and my 5 and 7 yr old loved them. plus high protein! searched for many recipes and this one is a keeper. well done. So glad I found your page! I made these last night and they are delicious! Perfectly cooked, soft, thick and chewy. Definitely filling! I added slivered almonds and used homemade coconut milk. My kids (1.5 and 4) love them as well. This recipe is going in my go-to book, thanks again! Can flax seeds be substituted for ground flax? Hi Debbie. I wouldn’t recommend subbing flax seeds since we can’t digest them in their whole form and they can be irritating to our gut. The bars are soft so whole flaxseeds would probably take away from the texture a little bit. Just delicious! Thank you for this great recipe! I made it in a non stick metal pan as I wanted to make sure I could get it right. I was wondering if you have tried this in a glass baking dish. My husband loved them too and wants them as snacks at work 🙂 so I need to make large batches. Do you happen to have an idea how the proportions might change if I made them in a 9×12 baking dish. I am hoping to make a double batch in the bigger ones. I’m glad you liked them, Sangitha! Thanks for letting me know 🙂 I haven’t tried baking them in a bigger dish personally, but I think you should be fine by just doubling the proportions. So I just made these. I used sunbutter and regular milk, but otherwise I followed your recipe exactly, but they are very crumbly and dry, and the oats are very dry. I am wondering whether you used regular rolled oats or quick oats? (I used regular, as that it what I assumed you meant) I was thinking next time I might try quick oats to get a softer texture, or maybe just let the mixture sit so that oats can soak up the liquid, or maybe a bit more milk or honey? I really like the idea of this recipe because I know my kids will eat them, I just need to get it softer and not crumbly. Any other thoughts or tips? Hi Lisa, I usually use quick oats for these, so that definitely might make a difference. If you’re finding them too dry, adding more milk should help soften them up. ok, that makes sense. Quick oats would make a huge difference. (You might want to update the recipe with that note). My kids have been devouring them anyway, and I think they’ll be even better with the quick oats. Also FYI – I used mini chocolate chips, which I think worked perfect, they are chocolately, but not as messy as they would be with full size chips. I don’t have any vanilla flavored protein powder or almond milk – I buy plain. Should I add more sweetener or vanilla flavor to compensate? No idea how those differ from what I have. Thanks so much, this recipe looks amazing. The biggest difference would probably be the sweetness, since flavoured protein powders tend to be a little sweeter. You could try making them with what you have and see if they’re sweet enough for you, and if not then add another spoonful of honey. I’m honestly not sure, Sarah. The only thing I can think of is maybe your nut butter was too dry? Or your honey? I’ve never had anyone say theirs came out too dry, so I’m not sure what the problem could have been. These granola bars look yummy! Protein powders absorb differently, even different whey based proteins. And oats sometimes seem inconsistent to me…Even ovens bake differently. Almond butters are so different, too. I love Justin’s almond butter, but it is SUPER thick compared to other nutter butters. Baked goods are always hard to get it just right for each individual. I find that I have to know what works for me and I have to know about the ingredients I use together. Amazing! Made them with vanilla vegalite and they are much better than Luna protein bars, much less sugar! Just wondering if you could leave out the protein powder if you didn’t specifically want protein bars? These look delicious and dying to make them but don’t have any protein powder! Hi Amberli! You would probably be fine with leaving out the protein powder all together. But you might want to add a little extra sweetener since the protein powder adds some sweetness. I’m looking for a protein bar that I can eat when I go out of town and these work with a few substitutions (my diet is VERY limited)! However, I will have no access to a cooler or fridge. Do you think they would last 4 days without refrigeration? They’ll be fine without refrigeration, Grace! I’ve taken then on plenty of trips and never run into any problems. Just found this recipe and made a batch last week. I’m making another (double) batch today because they are amazing!!! I made these today but only had chocolate protein powder. I had to modify it a bit because I had some different ingredients. I used 1/3 c coconut milk, natural peanut butter (instead of almond), 1/4 c energy blend (endamame, cranberries, almonds, and pumpkin kernels) in place of the chocolate chips, and agave in place of the honey. almond milk doesn’t have much protein. Would this recipe still work with dairy milk if I wanted to pack more protein into the bars? Dairy milk would work just fine, Nick! Thank you for this recipe! I had previously been using a (delicious) no-bake chewy recipe and they would just fall apart practically disintegrating if not kept very cold, so off to google I went. As I am a vegetarian and trying to up my protein intake (but not sugar) this looked very promising. I made them exactly as directed (except it turns out our almond milk nor protein powder were flavored vanilla, so we added an extra tsp of the extract) for the first try, they did turn out flatter than yours but still chewy, they don’t fall to pieces and kid-approved. They are quite good. We cut into bars and wrapped in saran wrap for easy grab & go use. I stored on counter so far, as I don’t expect them to last long. I think I will sub out the vanilla almond milk for coconut next time, maybe some coconut flakes. These are just what I’m looking for to use in kids lunch boxes and on the go. Maybe I missed it (?) but do you have any nutritional content info handy on them? Love your recipes! I’d guess they come out to about 150 calories per bar. Hi Amanda! This looks like the perfect filling energy bar to take to school every day. Is your vanilla protein powder sweetened? I only have unsweetened; should I add any extra sugar / sweetener? It’s lightly sweetened with stevia, yes. And depending on how sweet you like things, you could definitely add an extra spoonful or two of honey. These look fab! Was just wondering if I could leave out the protein powder and expect the same results? They should be fine without the protein powder, Lisa. If anything, tossing in an extra spoonful or two of oats would help. Thank you for this great recipe. I told my boys, I’m not buying anymore “junk” protein bars. Told them to look up a healthy recipe that looked good, they found this one! We’ve been making these for awhile (boys are 16 and 15). They love them before/after school, competitive sports…anytime. Now their friends are asking for them. Hi, I used the same recipe but it did not turn out chewy – mine turned out falling apart. This recipe looks great! I am cleaning out the pantry of all processed foods and the hardest one to get rid of (for my kids) are the granola bars. One question, my son is allergic to nuts. Is there a way to make this without the nuts? Absolutely! You could use either sunflower seed butter or soy nut butter in place of the almond butter, and another non-dairy (or dairy) alternative for the milk. I’ve made these with a roasted soy nut butter many times because I have a peanut allergy as well. Thanks! I just did some research and found coconut manna should be a good replacement. Appreciate the quick reply. Looking forward to making a batch! How long do they stay fresh? Could I freeze them? Thinking of making a huge batch to have on hand. Coconut manna! That actually sounds pretty incredible. I’ve kept mine on hand for up to 2 weeks at a time, but I tend to store them in the fridge after about a week or so. I’ve never tried freezing these particular bars, but I’ve done so with other bars with no problem. Do you use semi sweet or milk chocolate chips?? I just use whatever I have on hand, Nicole. Usually it’s semi-sweet. Do you have suggestions on the wet to dry ingredient ratio? And does the amount of oats to the amount of seeds or nuts have a factor in the chewy ness and ability to stay in bar form? I’ve found the amounts to work the best in the quantity that they’re given in the recipe, Heather. I’ve played around with the ratios before and it definitely affects ht texture of the bars. Thank you for a perfect recipe! I followed the recipe exactly and the bars are perfect! I love chewy bars and cookies. I take these to work and they are my snack between breakfast and lunch. My 7 and 5 years old sons love them, too! They have no idea they are eating something that’s good for them. It’s so nice to find a recipe that actually works. Keep them coming, please! Just made these and cut them. Mine were a tad on the drier side so not as chewy as they may supposed to be? I used a ground chia and flax blend (I was out of ground flax and would have added chia anyway) and used cacao nibs instead of the chocolate chips. Perhaps the addition of the chia made them drier. They are really good regardles of texture and I’ll definitely make again. My husband also loved them! Hmm. It definitely could have been the chia seeds, or sometimes even the texture of the nut butter could make a big difference (I always like using the no-stir store-bought kind so that it doesn’t end up too dry). You can always try adding more almond milk and/or a little bit more nut butter to soften them up some more! Could you substitute skim milk for the almond milk? Definitely! Any kind of milk would work. can you use rolled oats instead of quick oats? Love this recipe! I’ve been snacking on these bars throughout the week and they really ARE filling, dense and chewy. I made half of my bars without the chocolate chips and while both versions were good, I think the chocolate is just too good of a touch to miss out on. I’ll be making these again! Thank you so much for sharing. I do have one question though – I would like to double, possibly triple the amount of protein powder I use. Would I have to increase the proportions of any of the other ingredients? I’m so glad you liked them, Michelle! If you wanted to double the protein, I’d probably start by subtracting 1/2 cup of the oats. Add the normal amount of milk, and if the mix feels too dry, add a few splashes more until it looks more like the dough of the original. Whoops – It’s been a while but I’ve been meaning to update! I followed your advice and doubled the protein powder to 1 cup, and subtracted 1/2 cup of oats -there was no need to add more milk. It turned out perfectly! In fact, I didn’t even taste the difference. I am SO happy with this recipe, I’ve been making it weekly. Actually, I’ve been cheating and using sweetened vanilla almond milk… They come out WAY too yummy! I really appreciate the reply, Amanda. Thanks so much again! I’m so glad the variations worked, Michelle! Thanks so much for taking the time to check in and let me know – I’m betting others will find it helpful as well! Hello! I did my own protein bars with 100g oats, 100g peanut butter, 6 tbsp of honey and 5 cups of whey protein, i mix everything in the pan and cook for a cup of minutes, then i put the mix in separates molds and put in the fridge for 1 hour, but the glued is bad in my my mix.. And its taffy.. What can i do for make it more soft and glued better? LOVE these! just made them tonight. Question…. can i leave them out (in a sealed container) or do they need to be refrigerated? thanks! I’m glad you liked them, Christine! You can leave them out for about 5 days or so, and after that I’d transfer them to the fridge. These weren’t bad. I did substitute unsweetened applesauce for the honey because I’m trying to avoid sugar. They held together great, but a little tasteless and a little dry. Maybe the honey would have mad a big difference there. Will try again with the honey. Hi Jill. The honey definitely makes a big difference since that’s where all of the sweetness and flavour come from. The kind of protein powder you use will also affect the taste – I’ve found that flavoured ones do a lot better than unflavoured. Just wondering if brown rice protein powder would be suitable to use? That’d be totally fine, Aaron. These are great bars for adults and kids. I make them with vanilla whey protein powder (Optimum Nutrition), cow’s milk and smooth peanut butter. They always taste good and are easy to pack on a trip or for the pool. Thanks for the recipe! Delicious, easy and so healthy! And keeps me full for hours too. Thank u! This will become a regular part of my weekday bfast meal prep. Can’t wait to modify flavors and mix ins in coming weeks. Thank you for this recipe! I love how all ingredients are already things we have in the pantry. I can’t wait to try this! These are absolutely delicious! Going to be a nice grab-n-go breakfast item that goes into my regular weekend make-ahead list! Hi!! These are absolutely incredible. My boyfriend and I meal prep these for breakfasts and they give us just the energy we need to get to our next meal. Can these be frozen? I was thinking of making them as Christmas gifts for family and friends. These are delicious. I was looking for a good “chewy and dense” granola bar (yes I like them that way too) so these are perfect. My kids like them too so it’s a win all round. This recipe is a keeper. I just made these tonight and I’m not sure if I did something wrong but they turned out really dry. The only substitutions I made were to use peanut butter instead of almond butter (it’s all I had) and to use raisins and pecans instead of chocolate chips. Everything else I followed exactly. Are they supposed to be very dry?